Your question is best answered by discussing the Behavioral Economics (B.E.) concept of Mental Accounting. To those who have not read my past articles on B.E., this is a relatively new field that studies the decision-making process of consumers and how they are not always based on rational and utility maximizing principles, but are mostly affected by emotional and psychological factors. It is a combination of Economics and Psychology. Among the key principles in B.E. is Mental Accounting. It refers to our tendency to separate accounts based on a variety of subjective criteria, like the source of the money and intent of each account. According to the theory, individuals assign different functions to each group, which usually has irrational and detrimental effect on the consumer – i.e. utility is not maximized. However, since we are only human, we tend to treat this income differently. We always rationalize to ourselves, “Anyway, this is not expected, so I can freely spend it to give myself a treat…” If we keep on doing this, we won’t be able to take advantage of these windfall income sources in terms of our asset accumulation. On the other extreme, the more frugal ones will actually save everything since it’s not an expected income and take the opportunity to accelerate asset accumulation. Check yourself, what inspires you to do more of those extra income activities. Will a save and invest it all behavior make you happy or will a little treat move make you happier? I sometimes get the kick out of investing everything (Ilocana ngarud) but sometimes we like to buy something out of the proceeds of the windfall that will serve as a remembrance of that blessing. But at the very least, save the same percentage that you would on your regular income. Another Danger of Mental Accounting. This is best described by Thaler in his books by citing a conversation between legendary actors Dustin Hoffman and Gene Hackman (Click Dustin Hoffman’s Mental Accounting). The Upside of Mental Accounting. Given that money is fungible, the rational way of spending our money is to think of opportunity cost. If I buy this 6-figure bag, what am I foregoing? Well that’s pretty obvious, so let’s try a harder one. When I eat out everyday instead of bring baon to school or work, what am I foregoing? So you can relate this to the investments that you could have made, or the pair of shoes that you tried on and was a perfect fit last month. But can our human mind systematically do all these immediate assessments of opportunity costs? Nope, unless you’re Mr. Spock. So we resort to mental accounting. We assign buckets to our expenses. It is our way to guide ourselves to stay within budget. The jar system (similar to what Dustin Hoffman learned from his mom) is a handy tool to teach kids how to handle their money, how to allocate their funds according to what they value. If it works for little kids, it sure works for us! Just beware of the negative effects that rigid application can bring. So to answer your question how much should you spend and save from your “once in a blue moon income,” the answer is this: It’s your call. But knowing what you learned from the above, should the source really matter? 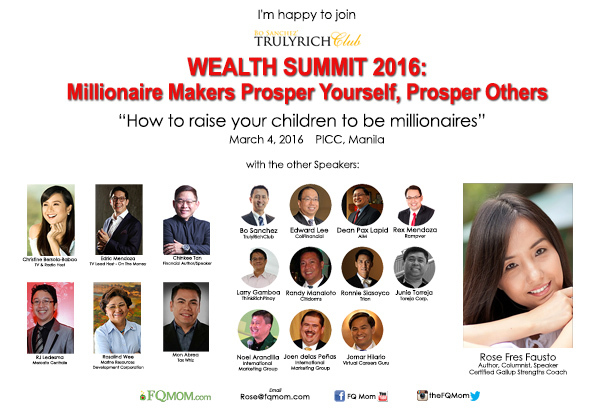 I will speak at the Women Empowerment Fair in Taguig on March 15 to talk about financial empowerment. ATTRIBUTIONS: Images used from bri-willimans.blogspot.com, gaminganddestinations.com, caritasplans.com, zastavki.com, dreamstime.com put together to help deliver the message of the article. Behavioral EconomicsMental AccountingRichard Thaler. Nudge: Improving Decisions on HealthWealth and Happiness Misbehaving: The Making og B.E.